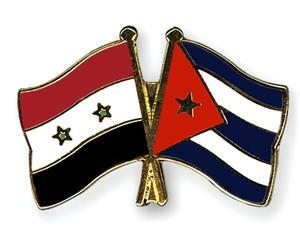 The President of the Syrian Friendship with Cuba Parliamentary group, Ayman Malandi ratified on Monday in Damascus an interest in exchanges at that level between both nations during an encounter with the Cuban ambassador to that country, Rogerio Santana. According to Prensa Latina News Agency, several deputies that are part of the National Assembly of the Syrian People participated in the encounter and reiterated the broad and traditional historic solidarity between the two countries. Malandi announced that in the coming days a declaration will be issued in support of Cuba before the growing hostility of the US government and against the economic, commercial and financial blockade against the Caribbean island. The Syrian parliamentarian said that like with Cuba, the common enemies will not be able to conquer us and will firmly continue the resistance against all foreign intervention in support of President Bashar Al Asaad and the Armed Forces. The Cuban ambassador pointed out the mutual interest in increasing and strengthening relations in a clear identification with the politics of both nations.